I stopped by the coffee shop the other day and Colin asked me, "Why haven't you written anything for Pencilstorm lately? Dude, Steve Perry sang on stage again. You gotta be dying to chime in about that." Well, Colin's right. There are a lot of things I want to write about these days: "Potential Journey Reunion" (bad idea), "Nigerian Kidnappings" (We can spend $500 mil looking for a Malaysian plane that fell in the ocean but we can spend any money to find 240 black girls? ), "My Band Broke Up After 25 years" (got divorced to 3 guys in the process), and then there's the "My Favorite Albums" that has brewing in my mind (gonna annoy a bunch of people with that one). But those blogs will probably never see the light of day because I'm on break from Pencilstorm right now. In fact, I shouldn't be even spending time on this blog. See when I'm not writing for Pencilstorm, I'm working on my other passion: novel writing. I have a book already published and am currently finishing book two. And if you've ever recorded an album, rebuilt your bathroom, or even put together a model car, you know that the last mile is the most difficult. So I'm taking May and June off to focus on getting my second book done. Let me put this in perspective - the typical Pencilstorm blog is 500 words (1500 if you're Ricki C). My novel is 80,000 words - that's a lot to manage. Right now I'm in the final editing stage (think of it like the final mix of your album). I'm also finishing the ever important book cover. Imagine how difficult that is - just like designing your album cover, it's got to be right on. People do judge a book by it's cover. So for now, I have to keep my musings to myself and finish this book. 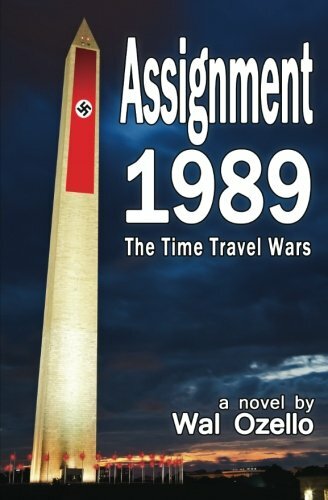 In the meantime, check out my first book, Assignment 1989. It's a science fiction thriller. Kind of like Tom Clancy meets Michael Crichton. I promise you there are no hairband references in it. Oh, wait a minute it takes place in 1989, yes there is a few mentions of Bon Jovi. But just a few. Wal Ozello is the author of Assignment 1989: The Time Travel Wars . He's a resident of Upper Arlington, Ohio and a frequent customer at Colin's Coffee.